Clear Base Stand Magnifiers are popular because of their fixed focus feature and clear acrylic base which allows 360° of light to illuminate the viewing surface. This extra large field magnifier is enhanced by a double lens system of two 63.5mm diameter glass lenses. The clear acrylic housing permits 360° of illumination. This magnifier features a rugged clear acrylic housing permitting 360° of illumination. The 28mm diameter acrylic lens gives you plenty of field of view for almost any project. This magnifier has a .875" (22mm) field of view and an 8X power. The price of the 730 is $8.95. 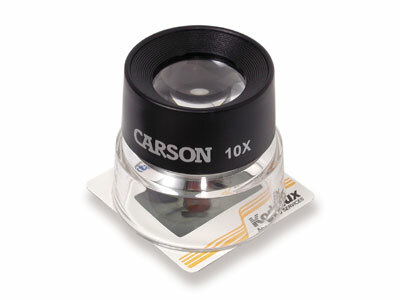 This imported 10X flat field magnifier has an excellent lens built into a light plastic body. Clear acrylic base makes for a bright viewing area. This unit has a .75" field of view and a 10X power. An outstanding value! The price of the 3510 is $9.95. Features 10X magnification with a generous and very bright viewing area that lends itself to the checking on art work, scales, and negatives. An unbeatable value! This reasonably priced yet powerful magnifier features an adjustable focus eye lens so the base can rest directly on the subject matter. The optical system is two acrylic lenses mounted in a molded plastic base. The field of view is 1.5" (38mm). This magnifier is inexpensive enough to use as a promotional item but is durable enough to use on the job. Contact us for logo imprinting and quantity discount information. The price of the 7504 is $9.95. This stand magnifier allows excellent access for a knife or brush to work on the viewing surface. 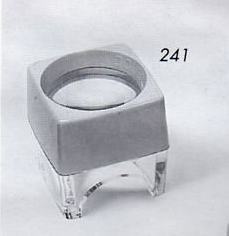 It contains a high quality acrylic lens. It has a 2.75" (46mm) field of view and a 3X power. The price of the 7556 is $7.95. The top of the line in terms of compact microscopes, this precision instrument features fully-coated optics, durable anodized aluminum body, and a clear acrylic base. It rests directly on the material for stability and focuses with a very smooth ring movement. Comes with protective molded case. Available with or without measuring reticles. The 25X reticle ranges from 0 to .12" in .002" increments. The 50X ranges from 0 to .06" in .001 increments.